I've been working on album artwork for a band in Barcelona, Spain. I was given a lot of freedom, which is always nice. These are just a bunch of little spot illustrations I whipped up for the interior art. 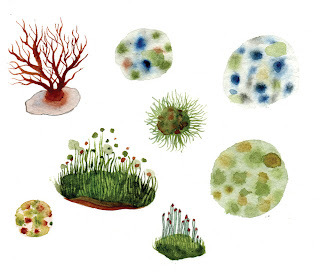 I stuck with what I love and know best: lot's of mosses, coral, spores, lichens (surprise!). The second image is not mine ( I wish). 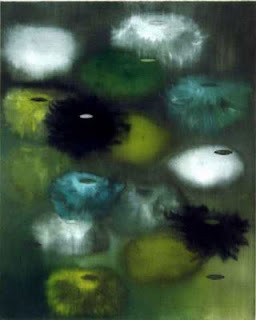 I've been thinking about the work of Ross Bleckner a lot recently. I have a book of his amazing watercolors. They always make me think of really elemental lifeforms: pollen, cells, spores, amoebas, moss etc. etc. The 2 paintings from the previous post about the Garfield Park Conservatory sold (YAY), and if you are reading this and you are one of the individuals that bought one: Thank you! If you are reading this and did not buy one but were hoping to, I will be posting a couple more next week.